This week WinADay Casino welcomes its 4000th Facebook Friend by doing something that's become really popular on its Facebook page. They're running a Trivia Contest awarding $50 freebies. Wild Alaska takes players to the northern wilderness with its animated Wolves, Polar Bears, Eagles and Moose. It’s generous with free spins where the Grizzly Bear is an expanding wild and wins have a 3x multiplier. Like the rest of WinADay’s games, it can be played on computers, phones and tablets. 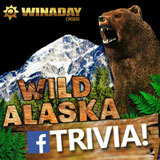 Wild Alaska is WinADay’s Game of the Month for November. One randomly selected player will win a $250 bonus at the end of the month, another will win $100 and three more will each get a $50 bonus. Judging by responses to last week’s trivia question, the “secret” is out that WinADay’s next new game will have a Greek mythology theme. Most Facebook Friends correctly identified the posted image as the Medusa symbol in the new game now in development at WinADay HQ. Trivia contests are fun but the other reason WinADay’s Facebook Page gets so many visitors is that Friends hear about bonuses that no one else knows about. The casino frequently puts bonus codes for extra freebies on the page, like the extra $10 freebie at Halloween. WinADay Casino offers 32 premium slots, 16 penny slots, 6 video poker games, Keno and Roulette. A brand new real mk.,= oney online slot game based on Greek mythology is expected before Christmas.